THE GRIND GALLERY PRESENTS LOUIS WALDEN ANDY WARHOL'S SUPERSTAR YEARS Photo by Venice Paparazzi. Thanks to Demetrios Mavromichalis and his family for inviting me to this grand art opening. Louis Waldon solo show “Andy Warhol’s Superstar Years” opening at The Grind Gallery. Silver Factory star to exhibit work appropriated from Andy Warhol’s iconic silkscreened and painted images dating back to the height of the Factory. Louie and Andy’s long time working relationship has resulted in a body of work that invokes the very essence of Warhol. Jackie, Marilyn, Liz, Brando, Elvis, and the rest will all be there. RENTAL INFO: Host Your Event at the Grind Gallery! Imagine holding your special event in an Large art gallery with a patio ! The Wood Cafe, the newest hotspot on the Westside. A partnership between Demetrios Mavromichalis (Venice Grind) and Laurent Triqueneaux (Cafe Laurent). The pair met at their neighborhood market and share an obsession with unpretentious, locally sourced food. Go early morning for fair-trade lattes and whole-wheat croissants, linger over French-style French toast (made with brioche and soaked in butter overnight), or avoid the office entirely (there’s Wi-Fi) to eat salads and sammies under the Shepard Fairey pop art prints all day. Everything from the bread (baked on the hour) to the free-range eggs (from the chef’s own chickens) is made with care. PHOTOS BY VENICE PAPARAZZI. Venice Paparazzi is a photo archive and event listing for Venice, California http://www.venicepaparazzi.com. MAKE YOUR NEXT EVENT TRULY MEMORABLE WITH YOUR OWN PERSONAL PAPARAZZI. List of Venice Paparazzi services. http://www.hirevp.com. NOTE: Contact Edizen directly if you would like your images removed from the Venice Paparazzi website. 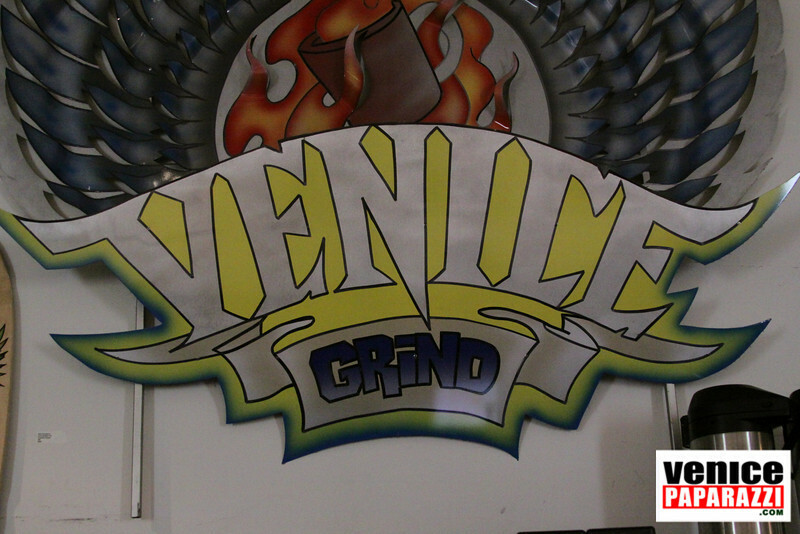 310.745.1064. info@venicepaparazzi.com. Photographs from this gallery are only for personal use. Always give Venice Paparazzi photo credit. Thank you in advance.